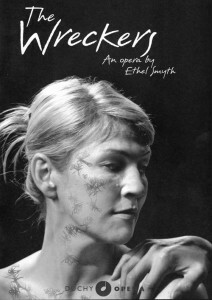 Ethel Smyth’s opera had never been staged in the UK before Duchy Opera bravely decided to perform it in Truro in 2004. The story, set in Cornwall, is based on a French play written by an Englishman, Henry Brewster. The libretto was translated into German for the premiere and subsequently into English for the UK concert premiere given by Sir Adrian Boult in 1908. AH: Duchy Opera’s director, David Sulkin, felt that the text was impossibly old-fashioned. so, thinking this would be a simple task, I agreed to rewrite it. It wasn’t simple, but it was fascinating to find myself in the British Library perusing Smyth’s own pencil markings on her full score. I’m not sure the result redeemed the dramaturgy (impossible to alter without rewriting the music…), but the production was a success and a hitherto forgotten opera was rehabilitated on 15 November 2006, the 100th anniversary of its premiere in Leipzig. for Jordan’s wave has washed them white. to dwell for evermore in glorious light. Praised be the Lord, the King of might!